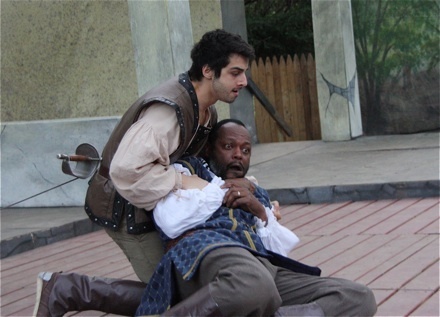 Ithaca Shakespeare Company - July 2013: Final Weekend of Shakespeare This Summer! All Thursday performances are Pay What Can ($10 suggested), as in previous years. Need another chance to see "Much Ado"? There's one more performance of Much Ado About Nothing coming up this Friday, August 2, at 6 pm in the garden of the Seward House Museum in Auburn, NY. Last chance to see the show that audiences have been raving about! Final Weekend Of Shakespeare This Summer! 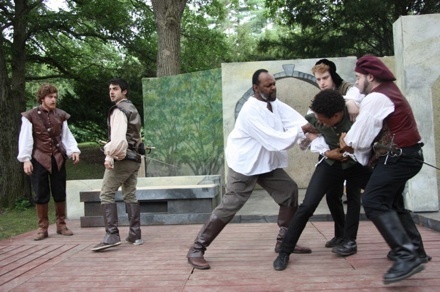 There are only three performances of Othello left at Cornell Plantations this summer. Don't miss this powerful drama of love and betrayal! "The performance was great and the actors were all so good, so EXTREMELY good, that it would be wrong to single out any one of them at the expense of the others." "It is experiences like this that cause us to pat ourselves on the back for our brilliant recent move to the area. We thoroughly enjoyed the play; it was a brisk and engaging performance by a very skilled cast in a beautiful setting. Because the players 'get' Othello, we were drawn in to the drama and occasional bits of humor throughout. You even arranged for perfect evening weather. We will be back!" "This was the first time we ever attended one of your shows and we loved it! Beautiful show, beautiful setting and it was a wonderful cultural experience. I would like to see 3 shows offered per summer!" "I'm still shaking. Even though I knew what was going to happen, the tension was overwhelming." "Excellent production. The actors playing the parts of Othello and Iago were especially good. This has become a treasured community resource." "This was my second experience seeing Shakespeare performed live and it has given me a whole new appreciation for the work. Previously I had only read it and to be honest, didn't really enjoy it. ISC brought alive the humanity and humor within the words. First rate acting, directing and choreography! I didn't expect to enjoy the experience nearly as much as I did and greatly look forward to future productions!" "My first one, and it was great fun! The acting, staging, costumes, set, surrounding - all professional and engaging. You can count on my return next year." "The actors drew me in to their world and tragedy. You all make it easy to appreciate Shakespeare!"